eToro was founded in 2006 by three partners, who aimed to create a financial trading platform suitable to the traders of all levels, offering easy and convenient trading tools. Nowadays eToro became the largest and most popular social trading broker and network that serves more than 6 million users from around 150 worldwide countries. Every day thousands of new traders continue connecting to eToro, so let us get closer and understand a reason for that. Since its launch, eToro has gone a path of innovation, creation and introduction of features that moved investment technology and online trading to a new level. Apart from the fact that eToro traders obtaining fast and convenient access to the world financial markets, the ability to copy successful traders from around the world without any commission. eToro strives to develop constantly not only its huge selection of assets, and include more and more Cryptocurrency pairs, but advance controls, features and other innovative trading tools that multiply trading technology timely. Is eToro safe or a scam? Apparently, this is the first question any trader should place before any further actions. Well, in terms of eToro brokering services, Yes they should be safe due to heavy regulation the company complies with. Services provided by eToro through its headquarters in Cyprus and its entities eToro (Europe), eToro(UK) and eToro AUS Capital authorized by three separate jurisdictions. The trading and investment activities fully comply with the measures and regulations set by the respected authorities, according to MiFID that serves European clients and provided by Cyprus Securities and Exchanges Commission (CySEC) and UK Financial Conduct Authority (FCA) licenses. In regards to Australian clients, eToro AUS Capital operates through Australian ASIC license. Hereby you can trade assured of protection under safety measures with the strict set of various regulatory standards, while all eToro procedures sharply concord with the international rules. As the funds safety is the primary aim, clients’ funds’ are segregated at all times and supervised internally and externally. This ensures maximum protection of account holders and does not allow eToro manage client money or use funds in the company own purpose. In addition, applied negative balance protection means trader can’t lose more than his initial balance is, therefore secures positions. Moreover, the eToro regulations assure the traders’ accounts by the compensation in case things go wrong with the company. The clients under Uk’s FCA eligible to eToro compensation of GBP 50,000 under FSCS and EUR 20,000 for CySEC clients. 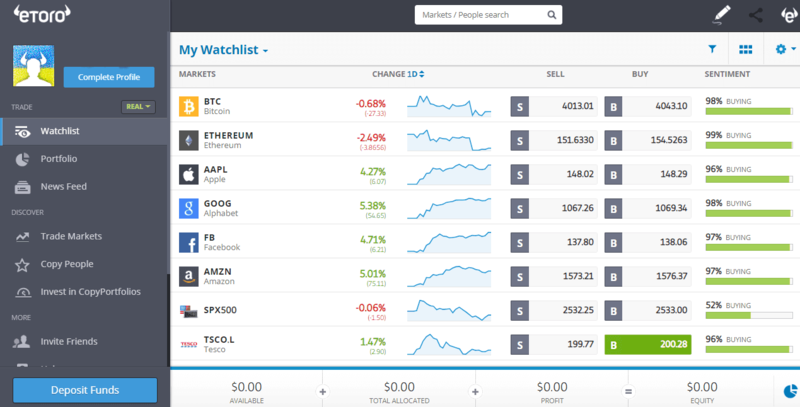 eToro markets range is among the most advanced in the industry, offers a truly wide range of products through thousands of different financial assets across categories. Each class has own characteristics and can be traded by a strategy suitable to particular trader or choice of the successful strategy to follow. The eToro products include currencies, commodities, stock indices, eToro CFD and a recent growing trend of Bitcoin or other cryptocurrencies as well. The platform is famous for eToro cryptocurrency trading using CFDs, which is a big advantage due to its affordable and secured nature and allows to trade eToro Bitcoin, eToro Ethereum, eToro Ripple, eToro Litecoin etc. eToro account conditions are built in a simple structured manner through a single account, designed to give tools for professional development and potential to progress. The traders account may be entitled to Premium services, with access to professional tools, unique promotions, as well as the personal account manager. Moreover, eToro bonuses new or existing clients by reward programs, for instance on every invited friend, through partner programs and a huge number of various communities. Along to that, all traders may use numerous features like eToro education that provides tutorials about a platform, support content with best practices, live webinars and the most recent data or updates. Use Demo Account as an option to run trials and test strategies with no risk, along with the assistance of great eToro Customer Support available 24/5 in various languages. It is a fact that the eToro company rapid reveille started with the presentation of the freshly created platform called OpenBook, the first platform with the concept of social trading, which offered clients to connect to trading communities and successful investors. Recently, the proprietary programs CopyTrader, CopyFund are extremely popular with the largest trading community, which allows newly joined traders to “search” the best ranked traders or particular strategy to follow. The measuring criteria to choose among the traders consistent of the risk level, stable weekly indicators, trading volumes, leading trades, etc. It is also interesting that not only transactions of individual traders can be copied, but investments too. Apart from its “copy trade” functionality, platform features are simple to use and understand, you can make transactions at the eToro platform with no need to download or install software, everything happens right through the eToro website. The platform offers different tools, including a separate schedule for each asset, featuring a number of settings, a large number of indicators and efficient functionality. Best of Show 2015 & 2017 | eToro innovative platform has received multiple awards and vast recognition as a leader in the Financial Technology industry. Moreover, eToro clients can enjoy mobile trading, which been integrated through two platforms (OpenBook and WebTrader) into one application. A single app making all features available: checking real-time feeds, copy other traders or to perform any permitted by platform action. Both Android and iOS devices are supported, which is a great way to trade at any time and under any conditions. Leverage, known as a loan given by the broker to the trader enables trading with a larger size than the initial invested capital is. As the leverage significantly increases the potential to higher gains, in reverse it does increase risk level too. Therefore, leverage may be risky at the point you set it wrongly or too high, thus the recent regulatory update in Europe and ESMA regime itself mandates brokers to set a maximum leverage level to 1:30 with a purpose to protect clients. Thus, eToro traders can use a leverage multiplier with a maximum of x30 for major currency pairs, x10 for commodities, x5 for CFD stocks and x2 for Cryptocurrencies. Another crucial point while choosing a broker is a trading fee, so let us have a closer look to eToro fees. eToro doesn’t charge commissions, their fees are generated and built into a dealing fixed spread, which is a difference between bid and ask price. Spreads may vary according to the eToro broker’s terms and generally are on a low and average level comparing to the industry offering. For instance, check out and compare eToro fees with its peer Plus500. eToro spread table on a most traded instruments gives you an example of minimum spreads. Costs are not guaranteed and presented for reference only, as the fee may vary according to market conditions and liquidity. You should consider also is an eToro overnight fee charged by the broker in addition to the trading fee, in case you hold long leveraged position for more than a day. The fee given by eToro is rather to be high, yet still among the competitive ones in comparison to a similar offering, e.g. eToro EUR/USD overnight fee is 3.7%. The last point is a fee for inactivity, which exists in eToro too. When depositing account deemed inactive for 12 months, a monthly fee to the sum of $10 will be charged from the particular account. The money management and funding methods at eToro are also quick and simple, which is very pleasant and important for traders’ convenience. A client can transfer money using a Credit Card/Debit Card, payment systems -PayPal, -Giropay, -Skrill, -WebMoney, -Yandex, -China Union Pay or bank transfer. All transactions are made as secure as possible since they are protected by SSL technology. eToro minimum deposit depending on clients’ region and country regulations and varies from $200 to $10,000. eToro withdrawal requests are usually processed quickly, funds are provided in the same way deposit has been made, typically within a few days. 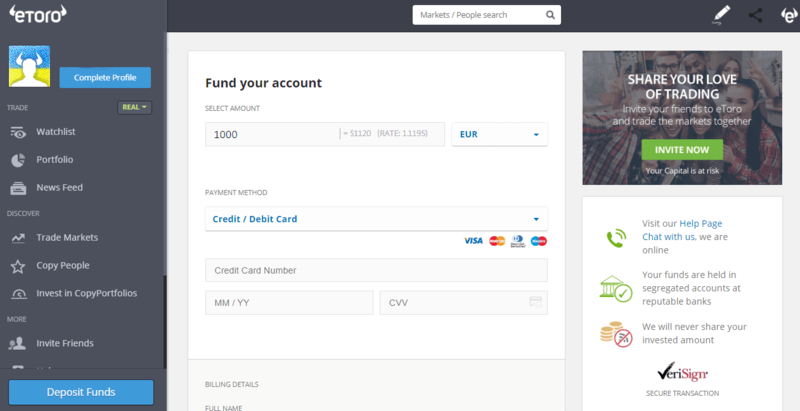 Count eToro withdrawal fee – $25, which is subject to every withdrawal request, while the minimum withdrawal amount is $50. It is considered to be quite high, as the broker will also charge a conversion fee for wire transfer, yet thinking about the rest of the advantages you receive it is possible to handle. So why did 6 million customers choose eToro? There are several reasons, and the main ones are the flexibility of the trading platform and the possibility of broad communication with other trading participants. Working on this platform is really easy and convenient. If you add to this the advantages and possibility of traders teamwork and high deal bonuses, it becomes obvious that cooperation with eToro can bring a good impact. In fact, though there are other social trading platforms available, eToro has become today the best and leading in its class. eToro is especially suitable for two types of traders. Firstly, the beginning traders interested in trading but want to learn and follow traders that are more experienced. And the second is the professional or experienced trader that would like to share his experience or unique strategy. In reverse both gaining more opportunities, funds to trade, earn a commission and get a successful trades from a professional, along to personal development among the community of traders around the globe. *CFDs are complex instruments and come with a high risk of losing money rapidly due to leverage. 74% of retail investor accounts lose money when trading CFDs with this provider. You should consider whether you understand how CFDs work, and whether you can afford to take the high risk of losing your money.